, a most celebrated physician and anatomist of Italy, was descended from a noble family, and born at Modena, most probably in 1523, although some make him born in 1490. He enjoyed a strong and vigorous constitution, with vast abilities of mind, which he cultivated by an intense application to his studies in philosophy, physic, botany, and anatomy. In this last he made some discoveries, and, among the rest, that of the tubes by which the ova descend from the ovarium, and which from him are called the “Fallopian tubes.” He travelled through the greatest part of Europe, and penetrated by his labour the most abstruse mysteries of nature. 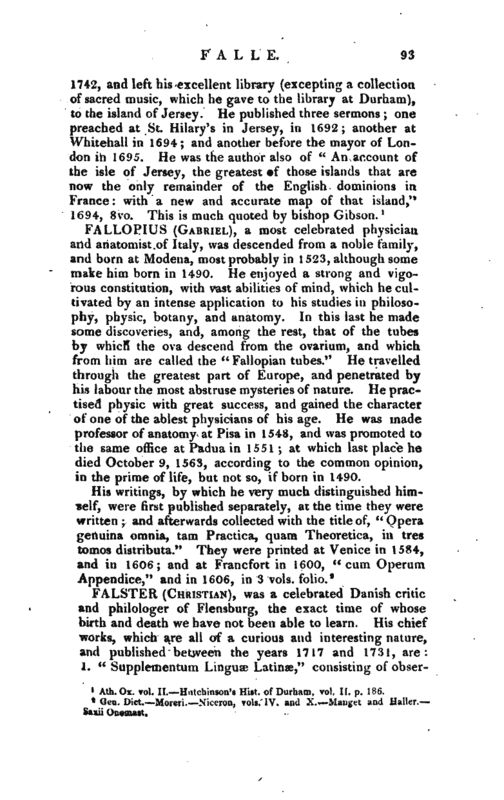 He practised physic with great success, and gained the character of one of the ablest physicians of his age. He was made professor of anatomy at Pisa in 1548, and was promoted to the same office at Padua in 1551; at which last place he died October 9, 1563, according to the common opinion, in the prime of life, but not so, if born in 1490. Gen. Dict. —Moreri.—Niceron, vols. IV. and X. —Manget and —Haller. —Saxii Onomast.